The Julia Ideson building, located at 550 McKinney Street in downtown Houston, Texas, was completed as the main public library for Houston, in 1926. It opened to the public on October 18 of that year and was originally called simply the Central Library. The beautiful Spanish Renaissance Revival structure replaced the Italian Renaissance style Carnegie Library building at the corner of Travis Street and McKinney Avenue (currently McKinney Place Garage) that had been completed in 1904 but which fifteen years later was deemed too small for the main library. Designed by architect Ralph Adams Cram of Cram and Ferguson, Boston, the Ideson was added to the National Register of Historic Places in 1977 and since 1979, following extensive restoration, has been home to the Houston Metropolitan Research Center which houses the Texas and local history collection, archives and manuscripts, and special collections of the Houston Public Library. A six-story gray granite structure was constructed on the block across the plaza to the west of the Ideson as the new central library building. Completed in 1976, the latter structure, located at 500 McKinney Street, has been known as the Jesse Jones Building since 1989. In 1903, Julia Bedford Ideson (1880-1945) was appointed librarian of the Houston Lyceum and Carnegie Library, which position she held for the next forty-one years. One of her many achievements in building collections and facilities of the library system during her service was the addition of the building that years following her death would be renamed in her honor. In 2004, then mayor Bill White initiated a move to update and restore the Ideson, which for years had been used to house the city's archives although cramped for space and deficient in facilities for the proper long-term preservation of paper materials. In 2006, preservation activist Phoebe Tudor founded the Julia Ideson Library Partners, Inc., a public-private partnership with the city, which raised $32-million to expand and preserve the Ideson. An archival wing based on Cram's original plan was added for the Houston Metropolitan Research Center and extensive renovations throughout were made to the rest of the structure. The building was re-opened to the public on December 5, 2011, and much of its current public use is as a venue for meetings, banquets, and weddings. Although renamed in honor of its long-serving pioneer librarian and administrator, the Ideson Building has the name of another veteran staffer associated with it as well (moreso nowadays in autumn than in other seasons). An original employee in the Ideson was Jacob Frank Cramer. Frank, as many public records show him, was employed as a custodian, beginning about 1913, at the Carnegie Library building and at the Ideson from its opening until his death therein on November 22, 1936. During the time of his employment at the Houston Public Library, he resided in the buildings he maintained. According to some patrons and library professionals, the spirit of Frank Cramer has never left the Ideson. Born on March 6, 1857, in Baltimore, Maryland, Jacob Frank Cramer was one of five sons of Jacob and Elizabeth "Lizzie" Cramer (Charles, John, Jacob, Adam, and George E., all born in Maryland except for John who was born in Pennsylvania). Frank's parents were German emigrants (Jacob, born in April of 1824 in Baden-Baden; Elizabeth, June 16, 1827, in Hesse-Darmstadt). The family (whose surname was often spelled with a "K") resided in Harford County, Maryland, as shown by the 1850 and 1860 censuses. The 1870 and 1880 censuses list the elder Cramers as residents of Baltimore. 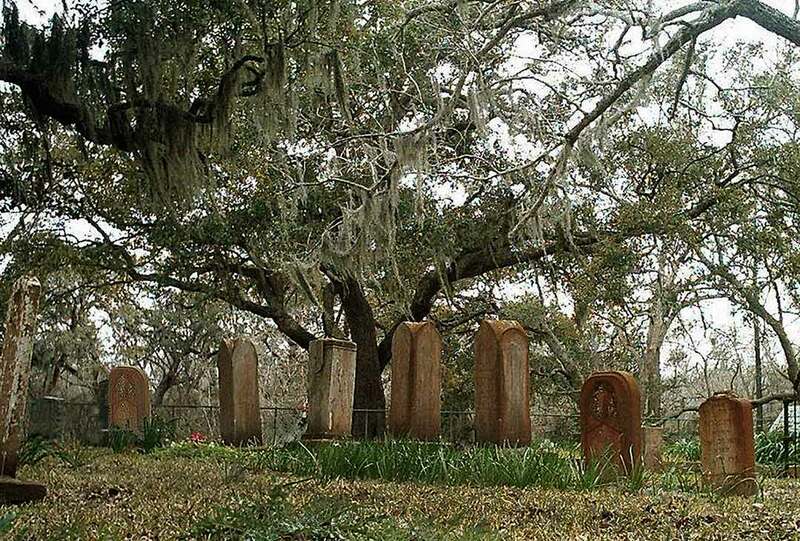 Frank Cramer's parents are buried in Salem Cemetery, Jarrettsville, Harford County, Maryland. (The senior Jacob died in June of 1898; Elizabeth, 26 March 1902). Frank was not enumerated with the family on the 1880 census, so by then he had left home. The next census to show him is the 1895 Iowa state census which lists him in Atlantic, Cass County. By then he was married and the father of four children. He and his family next appear on the federal census of 1900, which lists him in Horton, Brown County, Kansas, as a railroad laborer, the head of a household, consisting of his wife Ida and five children: Lawrence Reynolds, Cecil (a daughter), Lelia, Russell, and Lydia Wilma) . All of the children were born in Ohio except for two-year-old Lydia who was born in Iowa. Ida was Ida M. Reynolds, daughter of Thomas and Lydia Reynolds, whose household was in 1870 listed in Franklin, Marshall County, West Virginia, and in 1880 in Salem, Monroe County, Ohio. (Frank and Ida's son Lawrence, according to his World War 1 draft registration record, was born on April 27, 1883, so an estimated date of marriage for his parents would be early- to mid-1882. Lawrence's World War II draft registration card lists Clarington, Ohio, as his birthplace. Another birth record shows Lelia, sister of Lawrence, born 4 December 1889 in Clarington, as well.) The family was again listed in Brown County, Kansas, on the state censuses of 1905 and 1915, as well as on the 1910 federal census, whereon Frank's occupation was listed as odd jobs. One of Frank's jobs while living in Horton was in the rural free delivery system, having been appointed in 1903 and 1905. The Houston, Texas, City Directory for 1911 gives the earliest record of Frank's working and living in Houston. Therein he is listed as "Cramer J. F. buttermkr Texas Star Creamery, r[oo]ms 1805 Congress av." City directories for 1913, 1915, 1917, and 1918, indicate that he worked and roomed in the Carnegie library, at 915 Travis. (The 1913 directory shows "Cramer J. F. janitor Carnegie library, r. same," and the 1918: "Cramer J F janitor Carnegie Library res 915 Travis.") The city directory for 1920 indicates a change in employment, listing him as J. Frank Cramer and noting his residence at 114-1/2 Milam but no occupation or place of employment. The 1920 census seems to indicate he was living in a rooming house on Milam Street (probably the one mentioned in the directory) and working as a laborer at a creamery. Interesting is the notation of single as his marital status. The same year the new Central Library (the Ideson) opened in Houston, the Houston City Directory listed J. F. Cramer as "janitor Ho[uston] Public Library." Additional directory listings (for the years 1932 and 1935) show J. F. Cramer as the library janitor, and the 1930 census notes his residence there at the (then) 500 (now 550) McKinney Street, as well. There at 500 McKinney on November 22, 1936, J. Frank Cramer (born in Baltimore, Maryland, March 6, 1857, son of Jacob Cramer of Baltimore) died. The informant for the biographical background listed therein was Mrs. John Widman of Bakers, Kansas. Frank's remains were sent to Hiawatha, Kansas, county seat of Brown County. He is interred in Brown County, in Powhattan Cemetery. Among stories told about the Ideson is that Frank Cramer haunts the building, that he and his German Shepherd dog Petey can be heard there, Frank playing waltzes on his violin and Petey through the gentle clicking of his toenails upon the floor. It has been further maintained that sheets of music have been found in various places throughout the library, inexplicably scattered upon the floor during the night. Other witnesses have reported mysterious ghostly orbs moving inside and outside the building. Some surmise that they are signs of Frank Cramer's spirit moving about in watching over the library. © October, 24 2016 By: Ronald Howard Livingston, all rights reserved. The beautiful Majestic Theatre has been one of the most impressive of Dallas, Texas, landmarks since its construction in 1920 and 1921. This five-story Renaissance Revival edifice located at 1925 Elm Street was designed by John Eberson, the noted Chicago architect, under the direction of Texas businessman Karl St. John Hoblitzelle, a successful manager of vaudeville and movie theaters, and built at a cost of nearly two million dollars. With a seating capacity of 2,800, it opened on April 11, 1921, during the final years of the vaudeville era. The flagship of Karl Hoblitzelle's Interstate Amusement Company chain of theaters, the Majestic was the most impressive of a number of vaudevillian theaters that lined "Theater Row," which composed an entertainment district of several blocks along Elm Street. By the late 1970's all of these establishments but the Majestic had been demolished. 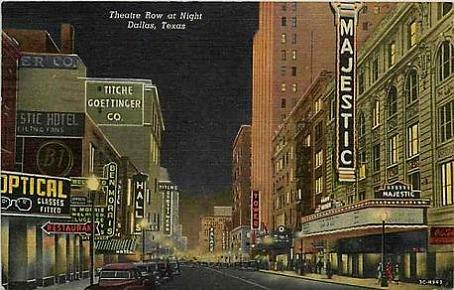 The Majestic is the third Hoblitzelle theater in Dallas to be so named (though there were other Majestics in the chain). It was built to replace the original Majestic Theatre that burned in 1916. That structure, built for Hoblitzelle in 1905, was located at the corner of Commerce and St. Paul streets. During the construction of the new building, the Old Opera House at the corner of Main and St. Paul was the temporary home of the Majestic. Impressively ornate throughout, the Renaissance Revival style Majestic Theatre was aptly named. The exterior front of the first-floor level originally was covered by an attractive canopy above which was affixed a large and impressive marquee and decorative lighting. Much of the upper four floors of the building (20,000 square feet) served as office space for conducting the business affairs of the Hoblitzelle chain. The indoor lobby and auditorium were decorated in the baroque style featuring elements such as Corinthian columns, egg-and-dart moulding, Roman swags and fretwork, and cartouches. Two upper balconies were reached by an elegant cage elevator featuring brass railing as well as carriage lamps on either side. The lobby featured beautiful black and white marble flooring and twin marble staircases. Brass mirrors, crystal chandeliers, ferns, and a marble fountain like one in the gardens at the Vatican added to the "Roman gardens" theme of the theater. Opened as an entertainment venue near the end of the vaudeville era, the Majestic in 1922 also began featuring motion pictures. Having hosted such show business luminaries as Mae West, Harry Houdini, Jack Benny, and Bob Hope, the theater increasingly was used for showing movies, with the live entertainment tradition carried on in occasional appearances of big bands featuring Cab Calloway and Duke Ellington. A Fort Worth resident named Ginger Rogers began her show business career singing and dancing at the Majestic. In 1932 the theater began showing movies exclusively. With the July 16, 1973, final showing of the movie Live and Let Die, the Majestic Theatre "went dark." The Majestic was used as the setting of the concert scenes in the 1974-released motion-picture-musical Phantom of the Paradise, written and directed by Brian De Palma. 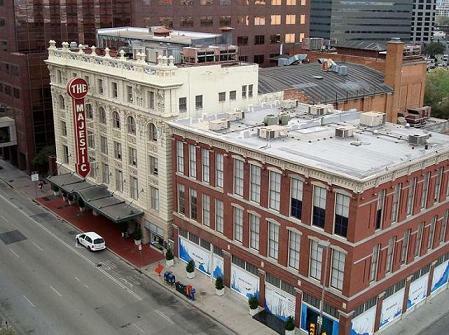 In January 1976, the Majestic was given to the city of Dallas by the Hobilitzelle Foundation. Careful, extensive, and detailed restorations and renovations under the direction of Dallas's own Oglesby Group soon began. In 1977 the elegant edifice became the first Dallas building added to the National Register of Historic Places, and in 1983 its import was recognized through a marker from the Texas Historical Commission. The Majestic Theatre reopened on January 28, 1983, and today hosts a range of shows such as comedy acts, dramatic plays, nationally touring concerts, and locally produced cultural and fundraising events. Managed by the City of Dallas Office of Cultural Affairs, the theater is also a venue for private functions and corporate meetings. As one would expect with a building nearing a century in age, reports have been made that would indicate a haunting of this historic showplace. Odd fragrances, backdrops that move unaided by human hands, and phone lines that light up though no one is calling have been cited as evidence of spectral presence. On several instances a single light bulb in a circuit containing other lights in the balcony has been said to suddenly illuminate. These and other strange occurrences have been attributed to none other than Karl St. John Hoblitzelle who passed away in 1967 but whose spirit is said still to linger in the theater he so loved. Joy Tipping a writer for The Dallas Morning News reported that in her twenties while working with the Dallas Ballet, which had offices on the upper floor of the theater, that her particular office had an inexplicable chill that necessitated her bringing a sweater to work. A door leading from the office into the theater likewise strangely was often unlocked and open though securely locked by her the evening before. She was finally informed by her boss that the office had been that of Hoblitzelle who used it as his personal entrance into the theater to check on performances. © September, 08 2013 By: Ronald Howard Livingston, all rights reserved.